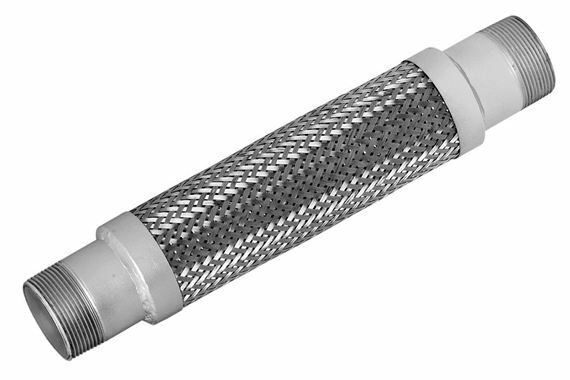 Stainless Steel Flexible Connectors contribute to the solution of vibration, noise, expansion and off-set motion problems in piping systems. Assemblies are designed for both high and low temperatures as well as high pressure and full vacuum. Our steam service ratings are very low in the interest of safety although our 70°F (21°C) pressure ratings are as high or higher than our competitors. All locations where failure could lead to personal injury or suffocation must be avoided. In dangerous locations we suggest housed expansion joints, solid loops, ball joints, packed devices, etc. rather than thin walled flexible products regardless of manufacturer. Call or email with full location description as well as service conditions for higher pressure or temperature applications. 304 SS can be used up to 850°F (454°C) in applications such as engine exhaust. When using MN products in copper or brass water or steam systems, dielectric couplings must be used on each end to prevent leakage from galvanic action. Sizes in RED are Minimum Recommended Lengths at Equipment Connections to Reduce Vibration Transmission. Safety Factor is 4X Rated Pressure. 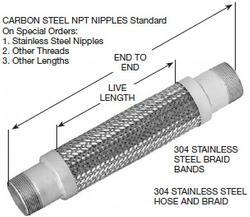 *Industry Pump Connector Lengths are not recommended, but supplied on demand. **Lateral Offset one side of centerline and normal machinery vibration. If intermittent in both directions, reduce by 50%.